Make sure to check out the amazing Super Saturday deals going on over at Scraps N Pieces! I’ve got three products in there for you this week. Any requests for next week? Hit me up and let me know! Hey guys! I’m so excited to be at Scraps N Pieces now. It’s going to be great. I hope you’re enjoying the move as much as I am. This month I’m hosting a challenge – The Photography Editing Challenge. Now, I know, photography editing sounds super scary, but I thought I’d try something to really make your photos pop without too much work – mats. Yep, no matter how awesome your photo edit it, sometimes it needs just a little extra to keep it from being lost on a page, especially a really busy page. Check out all the details and take the challenge here. Can’t wait to see what you make! Happy scrapping and God bless! Meagan has found her home! Are you as excited as we are?! Make sure to head on over and check it out. Her store is on sale for 30% off from now until February 12th to celebrate so now’s the perfect time to pick up some of her amazing kits, like this gorgeous bundle, Something Borrowed, Something Blue. And for a limited time, you can pick up the freebie add on! It’s available here, but only for a limited time. But don’t worry, it’s always available in the bundle. 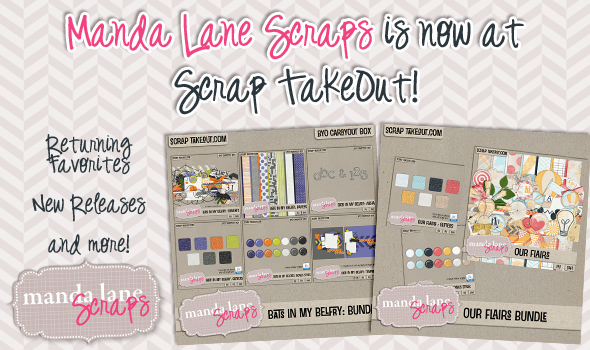 Yep, that’s right, I’ve got a huge announcement to make – I’ve moved to Scraps N Pieces! I’m really excited to be there as a lot of my digital friends are there, too. To celebrate my opening I have all my kits and add ons on sale for 25% off and all my already discounted bundles priced at 10% off. Those are some serious deals and I’ve packed my store full of awesome products! Check out my store here. Well, I guess I’m a little behind with blogging, but I guess it’s time to announce that I’m now a designer at Scrap TakeOut! (Wondering what in the world happened to me being at Stuff to Scrap? Check out this post.) And make sure to read through the whole post to get to the freebie! Autumn Blessings is a kit perfect for grabbing a warm drink, and muffin, maybe a blanket and those fun Autumn memories to settle down and scrap. Filled with beautiful colors and fun Fall elements, this kit is a must have for any fall stash! The rule of thirds is a wonderful way to scrap. It brings a whole new dynamic and perspective to your layouts while showcasing your special moments in the perfect light. My Third is the Word template set will have you scrapping with the rule of thirds in no time! This set includes 6 templates that employ the rule of thirds. Each template is offered in psd and tiff formats with the png layers included for other programs. Our flairs is a fun filled kit perfect for scrapping about your everyday adventures. This super fun kit is part of the We Are Memory Keepers 2013 collection started by Adriana’s Cafe. There are 7 12×12 jpeg glitter sheets and 1 .asl style included. My styles are always made from the glitter sheets, not the other way around, for the best results whether you use the sheets or the styles in your designs. Get these bonus acrylic styles with the glitters! Grab both the glitters and the kit in this fantastic money saving bundle! Check out what my awesome CT and I did with this kit! Boo! Got a little spookiness to scrap? Well, check out Bats in my Belfry. A little bit of cute and a little bit of spooky come together for the perfect halloween themed kit with these super cute elements! Pick up the Bats in my Belfry Papers today to add to your stash! These alphas are free when you purchase the Bats in my Belfry Papers and Elements all month long! These glitters will add the perfect bit of sparkle. As always, my glitters are made in full 12×12 sheets and then the styles are created from them, not the other way around, for the very best results whether you use the styles or the glitter sheets. Plus, get the bonus Acrylic styles, too! Boo! Got a little spookiness to scrap? Well, check out Bats in my Belfry. A little bit of cute and a little bit of spooky come together for the perfect halloween themed kit. These templates are in PSD and TIFF formats and include layer pngs to use in other programs. Grab all the spooky cute pieces of this collection in one money saving bundle! Phew! That was a ton! Glad you made it to the end. 🙂 Happy scrapping and God bless! 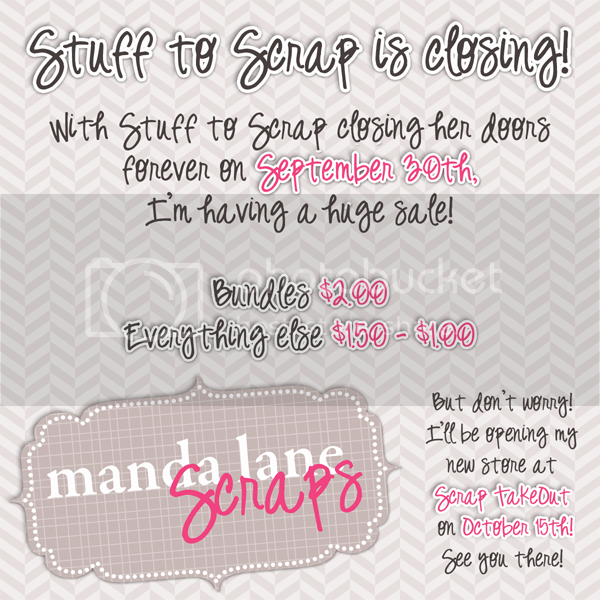 I’m sure you’ve all heard it by now, but I guess I ought to say it – Stuff to Scrap is closing her doors in just a few days. Monday will be the last day. It’s super sad for me. That was my first digital scrapbooking home. My dear sister in law, Christie (you may know her better as Scrappin’ Serenity) introduced me when she was competing in the Designer Darling competition probably 4 years ago. I was hooked! I joined the site in December 2009 and made my first layout that January with a kit that I think was titled Once Upon a Time by Scrappin’ Serenity. I jumped on board with the February blog train (French Tulips) that year and was hooked! It wasn’t great. In fact it was a pretty horrible little mini kit. The next one, Spring Picnic was a tiny bit better, but still pretty bad. Lol. Sometimes I look back at those early days and just laugh at how far I’ve come through learning and the mentoring of friends. I’ve been so blessed to know some wonderful designers over the years who have all helped to shape my designs. I really jumped on board with Stuff to Scrap in February 2010 when I became the Social Admin, a position that I held for over 3 years. In July 2010 there was a designer call. On July 5th I made the huge step and entered. Just 3 days later I had a kit, Retro Bowl, and turned it in. Then 5 nerve racking days later I got the email – I had been offered a spot! After a few QC fixes and much nail biting, I uploaded Retro Bowl July 27th. And that’s where this crazy ride began. And now it’s sadly coming to an end. All things must, I guess (except my faith, but that’s another blog in itself). There is good news, though. I’m having a huge sale! Make sure to check out my store before it closes and pick up your favorites at a deep discount. And remember, please download and check your files immediately. They will not be available after Monday night at Midnight (est). And just so you never miss any information on the move and everything, why not check me out on Facebook? I’d love to see you over there! Happy scrapping and God bless, friends! See you soon in my new store!